Repeat after me: Grains are not healthy. 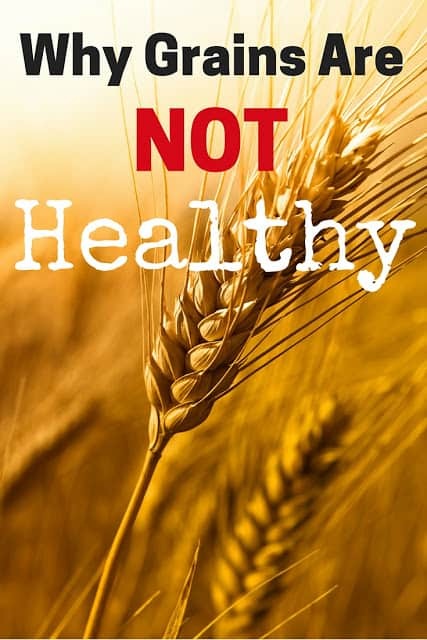 Yep I said it, and just for emphasis I will say it again: Grains are not healthy! Now I realize this goes against everything you have been taught. If you follow the Canadian or American Food Guides you would think that grains are the be all and end all of a healthy diet. Sorry to burst your bubble but I completely disagree. Unfortunately, those food guides are based on very poor science, and put together by folks that represent the grain board, the dairy board, and other such industries that ultimately profit from you consuming their food. And I am not just talking about gluten containing grains, but pretty much all grains (there are a few exceptions but we will leave those for another date). One of the most common questions I get asked by my patients is what changes to their diets they should make. Without a doubt my strongest recommendation is to eliminate grains. All grains. Is this an easy task? Absolutely not. But the health benefits are completely worth it in my opinion. Especially for anyone dealing with a chronic disease, and even more important for those with an autoimmune disease. Now there are many reasons why grains are not a healthy option. This might get a little long folks. So grab your fatty coffee, find a comfortable chair and keep reading to find out why grains are not healthy. Lectins are a plant protein that plant’s created to help protect them from insect predators. There are very high concentrations in plant seeds, which is what we eat when we ingest grains (as well as legumes, dairy and night shades). Lectins are problematic because they can cause damage to the gut. Normally, the cells lining your intestine are held together by connections called tight junctions that prevent foods and other particles from leaking out of the gut. Unfortunately, lectins can damage these tight junctions allowing small food particles, bacteria and toxins to leak out of the gut into the bloodstream, and thus get exposed to the rest of your body. This is what is known as leaky gut syndrome. This exposure of bodily tissues to foreign substances leads to increased inflammation in the body. And in some susceptible people, this increased inflammation and exposure to foreign substances can contribute to autoimmune diseases, cardiovascular disease, diabetes, irritable bowel syndrome, various skin conditions and many other health problems. In addition, beyond causing leaky gut, lectins make it more difficult to absorb the nutrients (vitamins and minerals) in foods. So while grains may be high in vitamins and minerals, your body actually absorbs very little of them. And ironically, the “whole grains” that are most highly recommended by our food guides actually contain the highest concentration of lectins, thus causing the most harm and providing the poorest absorption of nutrients. Phytic acid is the main storage form of phosphorus in many plant tissues, especially the bran part of grains and seeds. It is found in grains, seeds, legumes and nuts. Phytic acid works to protect the phosphorus by surrounding it in a snow-flake shaped molecule. Not only does this make it difficult for humans to utilize, but it also binds calcium, magnesium, iron, zinc and other minerals making them hard to use as well. This can cause problems such as tooth decay, bone loss and even poor growth and bone development in children. So again, while the grains themselves may contain important nutrients, your body can’t actually absorb and use them. In addition, physic acid also inhibits enzymes that are crucial for food digestion including pepsin, trypsin (for proteins), and amylase (for starch), again making it even harder to digest and utilize your food. The good news? You can significantly lower the amount of phytic acid in grains, nuts, seeds and legumes by soaking, fermenting and dehydrating these foods. As well, soaking these foods increases the amount of phytase available which is an enzyme that helps break down phytic acid, decreasing the phytic acid content even more. While beyond the scope of this post, The Weston A Price Foundation has a great article that explains everything related to phytic acid in much more detail. You can find it here. Gliadin is a protein found in wheat gluten that is particularly damaging to the intestine. Gliadin causes the intestine to increase its production of a protein called zonulin which causes the tight junctions between gut cells to separate (again causing leaky gut). In patients with celiac disease, the body makes antibodies against gliadin which then directly damage the cells of the intestine. But just because you don’t have celiac disease doesn’t mean that gliadin is safe for you to eat. In fact, it is likely that humans were never intended to ingest gliadin in the amounts that we are doing so today, but that those with celiac disease are just extra susceptible to the damaging effects of this protein. It has also been found that patients with other autoimmune diseases form antibodies against gliadin, again implicating the role of this protein in many other conditions beyond celiac disease. Many diseases have been linked to problems with gliadin including rheumatoid arthritis, depression, Sjogren’s disease, type I diabetes and more. Okay quick nutrition lesson. Fats or fatty acids are classified based on the number of double bonds between the carbon atom: no double bonds are saturated, one double bond is mono-unsaturated and multiple double bonds are polyunsaturated. The polyunsaturated fatty acids are further classified as omega 3 or 6 based on the position of the last double bond (in omega 3’s the bond is 3 from the end, and in omega 6’s it is 6 from the end). These polyunsaturated fatty acids are considered essential nutrients because humans can’t produce them, we only get them through the foods we eat. It is known that omega 3’s have potent anti-inflammatory effects, while omega 6’s can promote inflammation in the body. Ideally, our intake of omega 6 and 3 is in a ratio of 1-4:1. Unfortunately, the modern diet with its reliance on grain based foods leads to a ratio anywhere between 15-60:1. This shift in balance can lead to systemic body inflammation, and too much inflammation can contribute to or even cause a number of health problems including heart disease, liver disease, diabetes, autoimmune diseases, obesity, decreased cognitive function/memory loss, poor mood, various skin disorders and multiple neurological disorders. Almost every chronic disease has been linked to increased inflammation in the body, which is ultimately influenced by the amount of grains and grain based foods (including meat from grain-fed animals) we eat. Well there you have it friends. 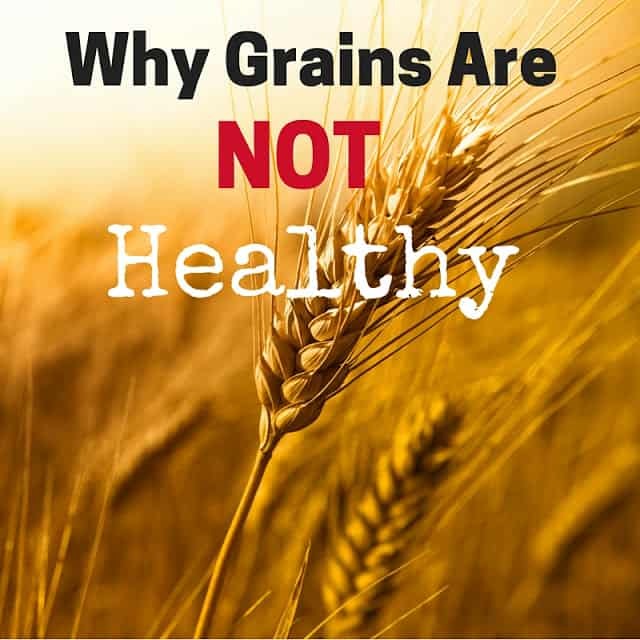 Why grains are not healthy! I would love to hear what you think about this information. Do you agree? Disagree? Please let me know!